Hoghton Tower is a fabulous wedding venue for wedding photography. Groomsmen pose for a photograph. The view from the top of the long drive as a wedding car approaches Hoghton Tower near Preston in Lancashire. A wedding photograph of a Bride arriving for her wedding at Hoghton Tower with her Father and Bridesmaids. A wedding photograph of a Bride and her Father arriving at Hoghton Tower for the wedding ceremony. A wedding photograph of a Groom with his Best man in the Great Hall waiting for the Bride to arrive. Wedding photography during the wedding ceremony at Hoghton Tower near Preston in Lancashire. 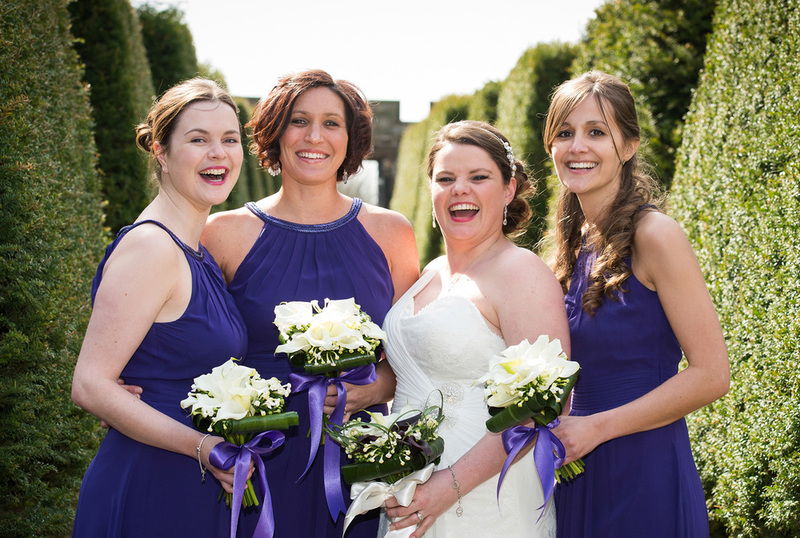 Wedding photography in the gardens of Hoghton Tower of a Bride with her Bridesmaids. The Hoghton Tower ramparts provide a superb location for wedding photography overlooking Preston in Lancashire. 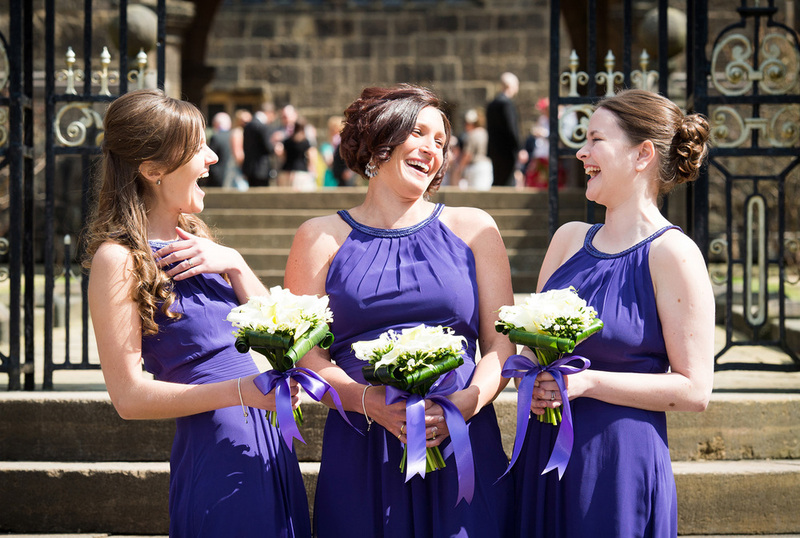 Hoghton Tower grounds are the perfect location for varied wedding photography locations. The gardens are beautifully maintained. Hoghton Tower near Preston in Lancashire has amazing gardens which are a wedding photographers paradise. Candid wedding photography during the speeches at Hoghton Tower near Preston in Lancashire. Natural wedding photographs at Hoghton Tower near Preston in Lancashire. Bridesmaids sharing a joke before the Bride arrives. A pretty purple colour scheme ran through every detail of this divine wedding day. Claire and Richard’s wedding was full of character, smiles and happiness – everyone was relaxed and ready to enjoy the beautiful surroundings and celebrate in style. With enough history to fill a textbook, Hoghton Tower is a truly compelling venue. Visited by King James I, William Shakespeare and Charles Dickens, the venue boasts a beautiful banqueting hall, flooded with natural light through four thousand panes of glass, and at night gives way to an open log fire and music from the Minstrel’s Gallery to take you back to another time. I loved shooting at Hoghton Tower, there were so many spots to explore, from The Tudor Gardens, the idyllic views across Lancashire, the Lake District and North Wales and the intimate, historical corners of the tower and its grounds. Call me on 01995 602181 for a chat or fill in the enquiry form.